Home >> Articles >> Senior Moments #1: "Because we can't"
Senior Moments #1: "Because we can't"
Back in the day of the last millennia, I had my first venture into teaching Martial Arts to the elderly. I secured a nice gig at the local senior center. There were about twenty intrepid explorers ready for the unknown. Back in the day of the last millennia, I had my first venture into teaching Martial Arts to the elderly. I secured a nice gig at the local senior center. There were about twenty intrepid explorers ready for the unknown. For, they did not know Taiji from Chai tea. Though I felt comfortable with over 20 years of teaching under my belt, I was definitely diving into the wild blue yonder. We got started with some relaxing, centering, and grounding postures and movements. All seemed to be going well. They were attentive and able to tune in to the Qi well. I felt pleasantly surprised. 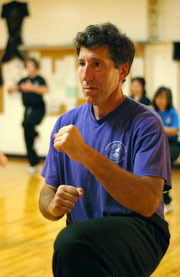 As with other Taijiquan classes I had taught, I guided the novices through basic core movements and Qigong. The feedback they gave was tremendous. I even experienced more clear and strong Qi than with any other group! We followed that with Taiji stepping. Though this was more challenging, as long as they paid attention to the Qi (which they did), this crazy way of walking was within their limits. I decided to move on to the bare hand form. My seniors got the idea and feeling of the first form, "begin Taiji" by sinking the Qi to the center. I proceeded to teach them "grasp the sparrow's tail to the right". I lead them through a nice developmental process, looked out to my audience, and to my chagrin, no one was raising the left leg as I had instructed! I felt a little confused, because they had been compliant up until now. Also, this was an elective paid class like all others that I teach. And didn't they want to learn (especially from me). So, I repeated the form, clearly stating what I wanted them to do. However, again they did not raise the leg. Hence, unlike a well prepared lawyer, I asked why they did not raise the leg. In unison they responded "because we can't". It took me a moment to process their candor. Then I realized that they were doing exactly what I had initially instructed. Do what you can. It is a simple mantra that I coach myself, students, and my children on a regular basis. I guess they got it and I am still learning it. We teach best what we need to learn the most. Early in my teaching career, I learned to adapt the militaristic Karate I had learned as a teen and young adult to the changing times, my aging process, and to the teaching of children. I realized that I needed to change the Taijiquan I had been learning since young adulthood to a population that generally did not have a Martial Art basis, was unfit, and had different goals than I had due to their age. It has been another amazing journey, and as with the Karate Kids, my seniors are teaching me as much as I am teaching them. Future "Senior Moments" articles will ensue. Feedback, questions, and ideas are encouraged.